eSmoke takes great pride in being an all American company that assembles and tests its products in USA. They offer a wide variety of starter kits ranging in price from $49.95 all the way on up to $249.95 as well as disposable ecigs. With two out of the five supplied cartridges failing on us, we cannot recommend the eSmoke starter kits at this time. Updated note: If you want to find products that are comparable to eSmoke, see our updated list of the best e-cigarettes for this year. And if you're looking for new e-juice flavors to try, the new list of the best e-cig liquid is a good place to start. In addition to e-cigarettes, eSmoke offers Mods (aka eSmoke Tank) for heavy smokers. You can also order a wide range of made-in USA E-Liquids to refill the tank cartridges or your own cartomizers on other mods. 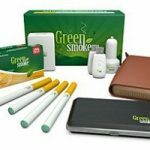 The eSmoke basic starter kit (at $74.95) includes two batteries, five tobacco flavored refill cartridges, a usb cable and wall adapter. We decided the average user would opt for the Sensation Series Basic Starter Kit and ordered one for review. Aside from the Express Kit, which looks like a pack of cigs, the Sensation Series are packaged in a sturdy bi-folding box with a magnetic enclosure, very similar to what we've seen with other starter kits. There is a velvet/foam top layer that holds the battery with a pack of cartridges, wall and USB charger held below. The battery is white with an eSmoke log printed around the base and light gold rings running around the length of the tube to mimic the look of a standard cigarette. Cartridges are beige with the nicotine strength printed below a gold ring. Fully assembled, the eSmoke looks very similar to a traditional smoke. Upon first inhalation, the eSmoke surprised us with a smokey taste that left out the sweet additives many tobacco cartridges have. Unfortunately, that is about as far as they get at replicating the feel one gets from smoking a cigarette. There was very minimal vapor with a 2 second drag and no throat hit. With so much potential for producing a quality smoke-like experience, the eSmoke's lack of vapor production kills any chance of this e-cig becoming a hit. For benefit of the doubt, we decided to try the rest of the cartridges to check if the first was possibly just faulty. The second cartridge performed identical to the first but the last three each produced a decent amount of vapor with adequate throat hit. We're not sure if this is a one-off but some quality control might be in order. If for some odd reason vapor production isn't an issue for you, eSmoke offers cartridges in eight other flavors including menthol, vanilla and coffee. But we wouldn't count on them working any better than the default tobacco flavored cartridges. The battery lasts for about a full day (medium use), which is comparable to brands such as EverSmoke and South Beach Smoke. Charging time can vary, but usually only two hours is needed to retain full power. When testing cartridges from another brand on the eSmoke battery, there was a vast difference in vapor production, leading us to believe there is no problem with the power level of the Sensation Series. The cartridges are what need improvement here. Aside from battery life, the two most crucial aspects to the performance of an electronic cigarette are flavor and vapor production. While the eSmoke sensation had a unique but realistic tobacco taste, it failed to deliver enough air flow to produce a substantial amount of vapor. The kit feels really cheap. Not sure if it’s made in China or US (as they claim), but either way it doesn’t feel as if the product is good quality. I have only tried one other kit from vapor4life, so I can’t tell how good or bad the quality of esmoke is compared to other companies. But I’m sure you can find a more decent product elsewhere.